These undervalued stocks could reward patient shareholders in the year ahead. The stock market has tortured investors so far in 2016. Major indexes like the Nasdaq are approaching bear territory and once high-flying growth stocks continue to suffer their worst losses in recent memory. However, the market volatility has also created some bargains for savvy investors that know where to look. Below, three Motley Fool contributors explain why Whirlpool (NYSE:WHR), Home Depot (NYSE:HD), and GoPro (NASDAQ:GPRO) are three big brand stocks that are undervalued in today's market. Sean Williams (Whirlpool): If you want a brand-name you can get behind and add to your portfolio that looks exceptionally cheap, I'd suggest looking no further than appliance kingpin Whirlpool. Whirlpool shares have taken an absolute thumping over the past year (shares are down 33% on a trailing 52-week basis) primarily because of the stronger U.S. dollar (roughly half of Whirlpool's sales come from outside North America), the threat of a growth slowdown in China, and the potential for increased competition in the United States. But, this thumping creates what I believe is an intriguing investment opportunity. To begin with, Whirlpool is a leader in innovation, and innovation is what'll keep it head and shoulders above its competition. A year ago Whirlpool completely redesigned its KitchenAid brand, going back to its roots and unifying the look of its large and small appliances. The look, described as "non-industrial," has a homely appeal that should differentiate it from its peers, and it may trigger an emotional attachment from a slightly more mature generation of homeowners. Secondly, Whirlpool appears likely to benefit from an ease of access to capital worldwide. The Federal Reserve's plans to raise lending rates have been thwarted by recent stock market weakness and the possibility that China's slowdown could prove a further drag on the global economy. This should mean that U.S. lending rates will remain near record lows, provided access to cheap capital for consumers to buy homes or remodel. As long as access to capital remains cheap, Whirlpool is in good shape. Lastly, Whirlpool's recently adjusted 2018 goals to demonstrate just how cheap the company could be on a fundamental basis. After reporting $12.38 in full-year EPS in 2015, Whirlpool is projecting full-year EPS of $20-$22 by 2018, or less than seven times where it's currently trading. If investors can look past the dollar-based sales and profit weakness and look at things on an operational basis, they'll see a remarkable company with a growing brand presence. Keith Noonan (Home Depot): Home Depot stock was one of the Dow's biggest winners in 2015, and its total return price over the last five years sits at over 240%, but such impressive gains provide all the more reason to question whether the success story can continue. While Home Depot's forward P/E value of roughly 19 prices it almost exactly in line with the home improvement store industry average, and potential changes to the housing market and Fed lending rates are factors that potential investors need to weigh, I think the retailer looks still has room to run and long-term growth potential in spite of risk factors. To get a sense of how the big box home improvement retailer has been able to deliver such incredible stock returns, take a look at its free cash flow generation over the last decade. The company generates tremendous free cash flow, and its successful expansions and highly regarded customer experience have helped the retailer build one of the most powerful brands in the America. Home Depot is seeing strong online sales growth, and the retailer's brick and mortar front look to be somewhat insulated against retail's broader movement toward online sales because many core products are difficult to ship or best seen in person -- roughly 40% of the company's online orders are picked up at store locations. Home Depot also has an exciting growth avenue that creates defensive benefits: The company is working to make home installation services an even bigger part of its business, and an upcoming generation of homeowners that appears to have relatively little in the way of home improvement and DIY skills could play well with the company's service strategy. 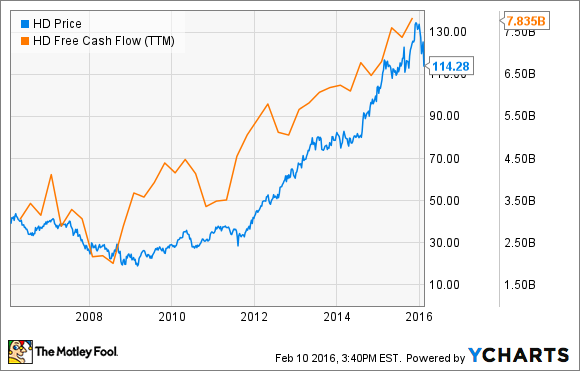 Home Depot's dividend also deserves attention. With a roughly 2.1% yield, the stock is above that 10-year treasure bond yield of roughly 1.7%, and the company's reasonable payout ratio of 44.2%, ample free cash flow, history of never lowering its payout, and an 136% increase in payout over the last five years indicate that it's reasonable to expect continued bumps. Tamara Walsh (GoPro): The action-camera maker might not seem like the obvious choice when it comes to undervalued brands. GoPro, after all, was one of the most anticipated initial public offerings of 2014. The stock soared more than 103% above its IPO price of $24 a share within days of becoming a publicly traded company. However, the stock has since come crashing back to reality and now trades at the bargain bin price of just $11 a pop. With GoPro shares now trading near record lows or at just nine times earnings, the stock appears undervalued. I believe this creates a lucrative opportunity for long-term investors. The pullback in the stock was largely tied to slowing sales growth and increased competition in the mountable camera space. However, these growing pains are ones that GoPro's management team is more than capable of surmounting. Owning GoPro when seemingly everyone else is running for the exits is certainly risky, particularly because it is a newer company without a proven track record of success. However, GoPro still has plenty going for it including its massive brand recognition. GoPro users uploaded more than 4.6 years of content to YouTube last year with the name "GoPro" used in the title, according to Google. Moreover, this level of engagement and brand equity should only increase in the quarters ahead as GoPro makes its software easier to use. International penetration should also help spur growth in the year ahead. In fact, international sales made up half of GoPro's total revenue in fiscal year 2015, with sales in Europe and Asia up 49% year over year. Wall Street left this stock for dead recently, but these catalysts together with new partnerships and endorsement deals could reinvigorate the stock going forward. We caught a glimpse of that earlier this month when GoPro's stock spiked higher on news of a licensing agreement with Microsoft. The bottom line for investors: GoPro is a big brand that has major growth potential and its undervalued stock creates a buying opportunity for patient investors.